Melksham is a friendly old market town with a population of around 24000, situated in the triangle between Bath, Swindon and Salisbury. Places of Interest are shown on the Town Council's web site, and there's plenty of other interesting places close by such as Lacock, Corsham and Devizes - all reachable by bus, and Chippenham, Trowbridge and Westbury reachable by train. 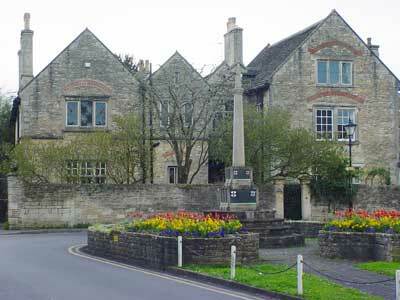 Plenty more pictures of Melksham, with links and maps, on my "work" website. 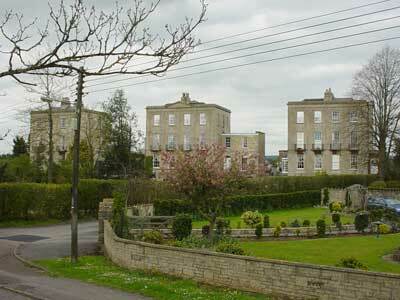 Melksham was going to be a Spa town to rival Bath, and these three grand buildings were built in 1813 as lodging houses for the clientelle coming to partake of the waters; a ballroom (still standing) and well head cottage were also built, but the scheme didn't take off and the houses were sold off a few years after the scheme was instigated. The national cycle network passes through Melksham, and signposted cycle routes off it lead to the station. Perhaps the most complete list of accommodation in and around Melksham ... and it even includes direct contact phone numbers and email addresses so you don't have to use an agency! Melksham has a large number of places to eat - and we've tried to list them all! There's also Graham and Lisa's selection of 10 of their "out of town" favourites if you're staying in the area and fancy a short excursion.